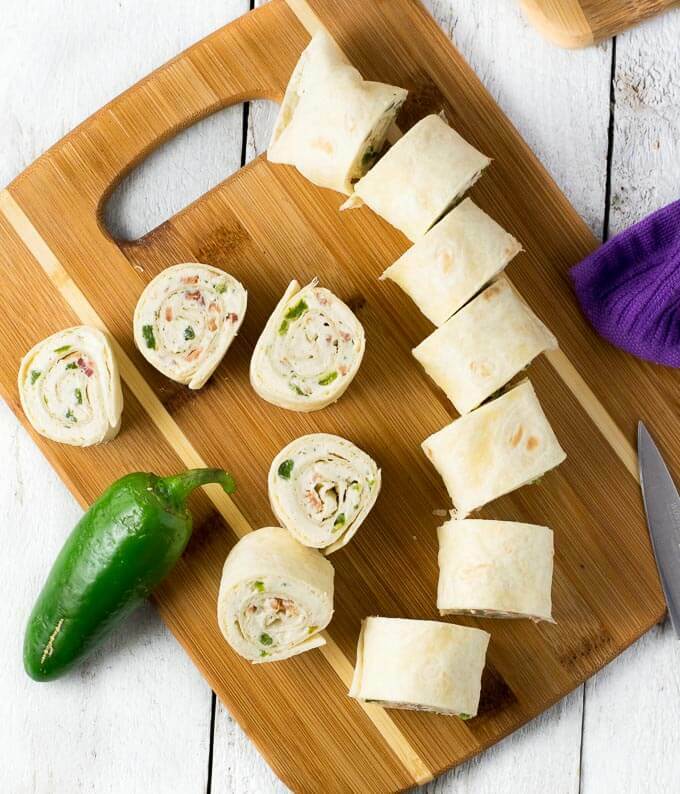 These Bacon Jalapeno Popper Pinwheels are the ultimate party appetizer. Tender flour tortillas are bursting with ranch-seasoned cream cheese, lively bits of jalapeno, and hearty chunks of smoky bacon. I spent the past week camping in Alaska, doing my best not to let the can of bear spray I purchased go to waste. Though I saw three grizzly bears at a distance, unfortunately, I purchased the bear spray for nothing. Too bad I didn’t get attacked, I really hate wasting money. Oh well, after a week of eating freeze-dried camping food, I couldn’t be more excited to be back to civilization eating my favorite foods again, like these Bacon Jalapeno Popper Pinwheels! 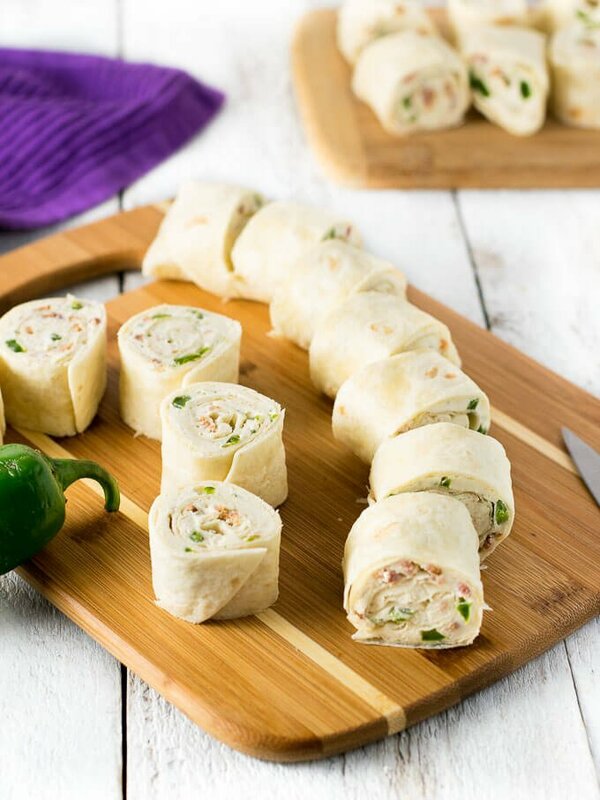 If you are throwing a party, you need to put these Bacon Jalapeno Popper Pinwheels on your appetizer menu. They are filled with the classic jalapeno popper flavor you already love, but unlike their deep-fried counterparts, they can be made in advance. Your guests will have them devoured in no time! 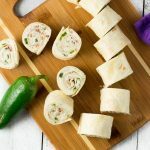 Though traditional jalapeno poppers don’t typically contain ranch seasoning in the cream cheese, I think it is an important addition to these pinwheels. It really adds a lot of flavor and helps prevent the taste from being one-dimensional. This is also the perfect appetizer to make in advance because it tastes best when made in advance. Letting these sit in the refrigerator for 2 hours, or longer, helps the flavors meld together and softens the tortillas. These can even be made the day prior if you wish. Free tip: I did not include cheddar cheese in this recipe, but I strongly considered it. If you are dying to add cheese, 1 cup of shredded cheddar cheese would be a great addition. I like serving food like this on stylish cutting boards, but any appetizer platter works well at a party. 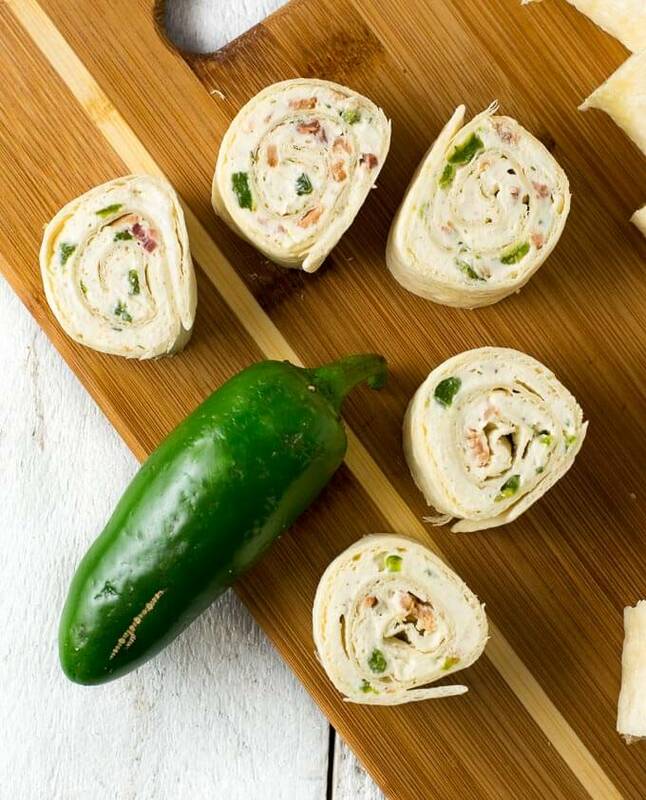 Quite honestly, your guests won’t remember the serving tray, they will just remember your Bacon Jalapeno Popper Pinwheels! Cook bacon in skillet until crispy, remove and crumble. Reserve 1 tbsp bacon grease in the pan. Cut jalapenos in half lengthwise and scoop out the seeds. Finely chop the jalapenos and add to the skillet with bacon grease. Cook until softened. Add cream cheese, ranch seasoning, crumbled bacon, and jalapenos to a bowl and mix thoroughly to combine. Scoop out ½ cup of the mixture and spread evenly across one side of each tortilla. Starting at one end, tightly roll up each tortilla and place in a pan seam side down. Cover the rolled tortillas in plastic wrap and place in the refrigerator for 2 hours or longer to soften and absorb the flavors. Cut into 1” pieces and serve. IF YOU LOVE Jalapeno Poppers, check out this Jalapeno Popper Casserole too! If you enjoyed my Bacon Jalapeno Popper Pinwheels recipe then you should probably like me on Facebook and follow me on Pinterest too. That’s what I would do at least, because if you don’t get to know me but you still use my recipe it is kind of like taking candy from a stranger, and your mom taught you not to do that. Don’t disobey your mom, subscribe to Fox Valley Foodie today. I love these, I make them every Christmas. And they are so easy to make.